The credit crunch has been affecting most of us, but the majority still don't realise the proportions of it. The slide below, which was published by JP Morgan, is a clear and concise snapshot of the current situation. 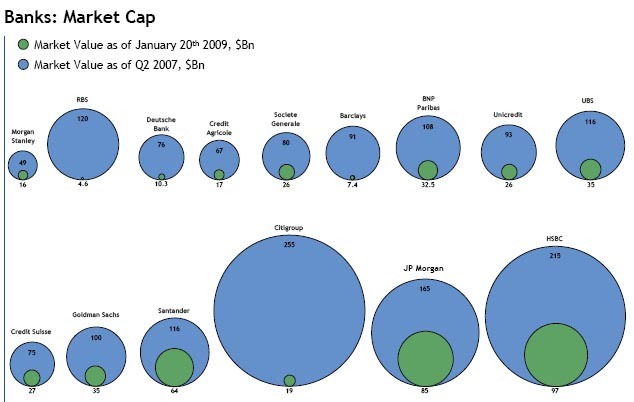 It shows with just one image how big financial giants have been shrunk to a fraction of their original value. This would have been unthinkable a couple of years ago. How is the credit crunch affecting the restoration and entertainment industry in Singapore? Has it left restoration businesses deserted? Certainly, the higher end restaurants have been more affected, while consumers have diverted to cheaper options. How has Foodieah responded to the credit crunch? A foodie can't survive without the joy that beautiful, fresh food can provide. While I still enjoy eating out and reviewing restaurants, like most of us I would still love to enjoy what I used to eat paying a premium, only cheaper. How can this be achieved? Cooking. As you might have noticed I started to introduce more recipes into this blog, and expect more to come!